The image of the Old Mill is the symbol of Waterford today-a community landmark in stature and history. It illustrates the reason for the existence of the village at this location and the important relationship of Waterford to the surrounding farmland. In 1733, Amos Janney, a Quaker from Bucks County, Pennsylvania, purchased 400 acres along Catoctin Creek in the fertile Loudoun Valley. He constructed a log mill on the creek not far from the site of the present mill. Janney was soon joined by others drawn to the rich farmland along the banks of Catoctin Creek. From this site, a little settlement grew rapidly until the mill was the hub of a thriving agricultural community. Known as Janney's Mill until the 1780s, this early commercial center became what we know today as the village of Waterford. A mill is a building housing a set of machinery that processes raw material into finished products. Waterford's mills produced flour from grain; building lumber from logs, fabric from cotton and wool fibers, and lime for fertilizer and mortar from limestone. How is a mill powered? 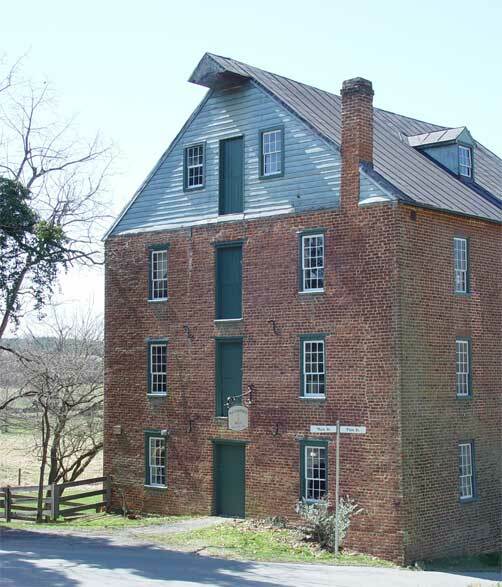 Janney's original log mill was powered directly from the flow of Catoctin Creek. By the early 19th century, millers were harnessing waterpower through manmade channels or races. When Mahlon Janney built his stone and wood mill at the location of the present Old Mill, he dammed the Catoctin and diverted water from just behind the dam through a mile-long headrace to direct water over the wheel in the volume and speed required to power the mill. The design and construction of this race were an engineering feat-beginning with a dam to hold a reserve of water from Catoctin Creek, a chute to allow the race to pass over another stream without emptying into it, several overflow gates to prevent flooding during high-water, and finally a sluice gate to control the flow of the water from the headrace over the millwheel. A manmade tail race carries water away from the mill. 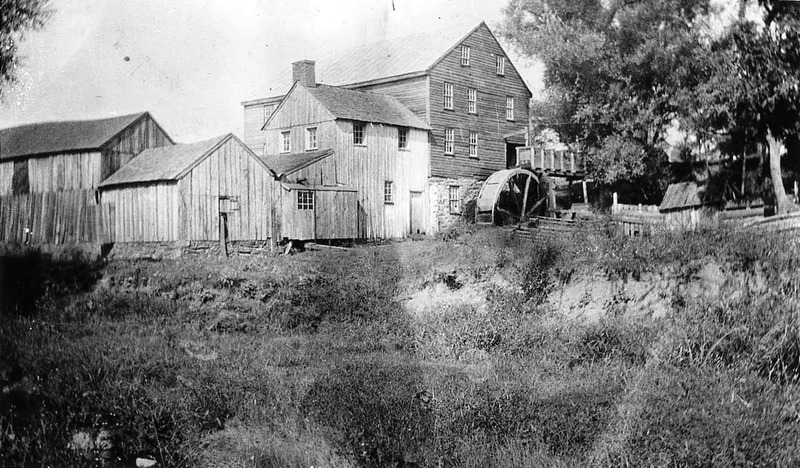 Schooley Mill and the fulling mill were powered by a second race, fed by Ball's Run. How does a gristmill Work? Water running over a water wheel powers machinery that processes grain into a final product. Initially, the wheat or other grain is screened and cleaned to exclude foreign seed and other impurities. Next, the grain is weighed. During the milling, or grinding, phase, the wheat is reduced to flour. Initially, the Old Mill used the movement of grooved burr stones to grind kernels of wheat. This grinding process removes the outer husk from the grain then powders it into flour. In 1885, roller machinery was installed in the Old Mill. The roller process uses a gradual reduction method in which each step in grinding is performed between steel cylinders, first grooved ones, then in the final stages, smooth surfaced rollers, working at differential speeds. Once the grain is processed into flour, it is bolted, or sieved,·to remove any bran particles. The final product is then packaged or bagged and sent to market. By 1762, the growing population of grain farmers had necessitated the building of a larger grist mill on the site of the present mill. An adjacent saw mill provided lumber to build houses and barns, and roads were constructed to facilitate travel to and from Janney's Mill. Reflecting the fertility of the surrounding farmland, the mill was again rebuilt and enlarged in the 1820s. This is the structure we know today. Two additional mills operated in the village. Schooley Mill, near the corner of Factory and Second Streets, primarily a saw mill, also ground corn, limestone, and clover. Another, near the corner of Clarke's Gap Road and Factory Street, functioned as a cloth manufactory, or fulling mill*. By 1835, the settlement had grown into a village serving as a commercial hub to the surrounding farms. With the nearby Chesapeake and Ohio Canal in operation in the 1850s, Waterford's mills were providing products for an even wider market. Barrels of flour were hauled to Point of Rocks, Maryland, ten miles north of Waterford, where they were loaded onto C&O Canal barges or the Baltimore and Ohio railroad to be taken to the lucrative markets of Washington, DC, Alexandria, and Winchester. Following the Civil War, which devastated Waterford's economy, the mills continued to operate. The Washington and Old Dominion Railroad was extended from Leesburg west in 1870, bypassing Waterford and depriving it of its once dominant trading position. The village never returned to its former commercial success because area farmers and village residents could now import machine-made goods. However, enterprises supporting agricultural needs-blacksmiths, wagon builders, harness makers-remained working in the village until the early 1900s. Waterford's mills continued to operate and export grain to markets made accessible by the railroad. The Old Mill was the last of Waterford's mills to cease operation. In 1939, the mill stopped grinding, marking the end of the milling industry in Waterford. The Waterford Foundation purchased the Old Mill, and later the Schooley Mill, to ensure the preservation of these buildings which housed one of the main livelihoods of the village for over two centuries. Amos Janney settled in the Loudoun Valley in 1733 and soon after built a log mill on Catoctin Creek, not far from the present location of the Old Mill. His son, Mahlon, developed this family mill into a larger operation by 1762, when he erected a larger mill of wood on a stone foundation, at the site of the present mill. Mahlon's new mill was a custom mill, grinding not only wheat grown on his own land but also providing services for other farmers settling around "Janney's Mill." A sawmill operated adjacent to the large grist mill at various times during the 19th century, providing lumber for buildings. The existing mill was built in the 1820s. This larger mill increased the production capacity-its proportions reflect its importance to the agrarian economy of Waterford. In 1885, an entrepreneurial mill owner, James Dodd, enhanced the grinding wheel system with roller machinery, making the mill the most technologically advanced in the area. In 1888, a large three-story addition was made to the rear of the mill, doubling its size. The Old Mill ceased operation in 1939. Recognizing its importance to the history of the village, the newly formed Waterford Foundation purchased the building in 1944 to ensure its preservation. The building has been used to display traditional 18th and 19th-century crafts during the annual Homes Tour and Crafts Exhibit for the past 55 years. 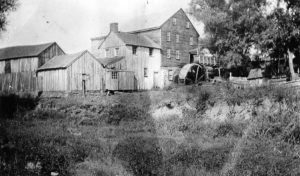 In 1803, Mahlon Janney secured water rights on Ball's Run and began operating a grist and sawmill, now known as Schooley Mill, at the southwest corner of town. Throughout its history, this mill specialized in many services - grinding corn, removing clover seed, processing limestone into lime for use as fertilizer and in mortar, and milling lumber. Schooley Mill operated until the 1920s. Portions of the mill complex were later converted into a barn. Another venture of milling magnate Mahlon Janney was located at the southeast end of the village on the north side of Ball's Run. The mill operated from the late 1790s to the 1850s and is significant for its use as a woolen mill and manufactory. Fulling mills such as this cleaned raw fiber of animal grease and soil, smoothed the fibers, shrank newly-woven fabric to a firmer weave, then stretched it to dry. In the early 1800s, James Moore and James Farquhar operated the mill. In 1813, Moore wrote to Lawrence Lewis, nephew of George Washington, that "the demand for coarse cloths has been so great that we have not made one blanket this season, therefore [it] will not be in our power to supply thee this season but hope before another to be better prepared." The mill operated as a fulling mill until 1837, providing services to the local community and exporting products as far as Alexandria. Although no physical trace of this mill remains today, deed records tell us that it was a brick structure, and research indicates that the building housed a grist mill and brewery at different times prior to closing in the 1850s. * Fulling is an old process used to increase the weight and bulk of cloth, especially wool, by controlled shrinking and beating.